Sakuma Jurozaemon of Araoi village in the Ichihara district of Kazusa province was a wealthy family that in the area was called one and would descend to two. [Jurozaemon] sought to push down Sakuma Tadashichi of the principle house and usurp his property [assets]. . . . Tadashichi was man of deeply wanton desires and was carrying on with Jurozaemon's younger sister, and his wife, hearing about this and unable to bear [control] her rage, came to Jurozaemon's home carrying a drawn sword and began cutting his sister. She inflicted [caused the sister to bear] wounds in several places, but fortunately they were light and her life would probably be saved. 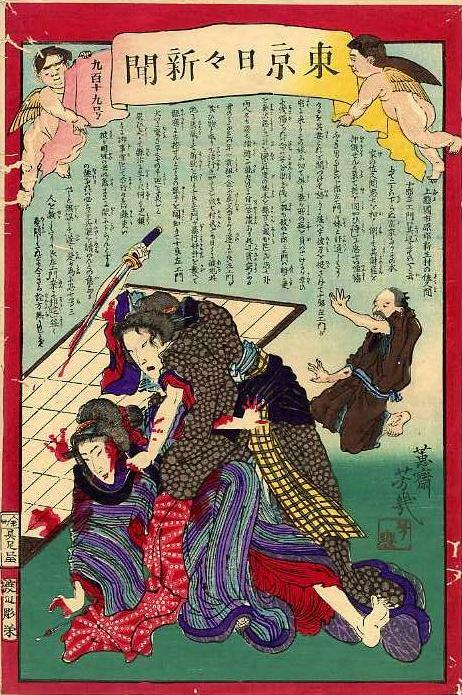 Now Jurozaemon privately delighted in this, and immediately devised a plan [scheme] and reported the particulars of the incident to prefectural officials, and when [authorities] quickly seized and bound Tadashichi and two others there was laughter and talk. . . .
Kazusa reflects 上総, glossed かづさ (Kadzusa), from Kamitsufusa (上総 かみつふさ), the "tsu" being an older genitive (possesive) marker, equvalent to の (no) or が (ga). The province of "Upper Fusa" is now the central part of Chiba prefecture. Confer Shimōfusa (下総 しもふさ > しもうさ) from Shimotsufusa (下総 しもつふさ) -- or "Lower Fusa" -- now the northern part Chiba prefecture and part of Ibaraki prefecture. Upper and lower Fusa were also called "Southern Fusa" (南総 Nanō) and "Northern Fusa" (北総 Hokuō). Together they were part of Sōshū (総州). The two provinces, and Awa (安房) province, were called "Bōsō" (房総) -- as in Boso peninsula, the part of Chiba prefecture that juts into the Pacific to form the eastern shore of Tokyo bay. Araoi village (新生村 Araoimura), later part of Sanwa (三和町 Sanwamachi) of Ichihara county, is now part of Ichihara city in Chiba prefecture.